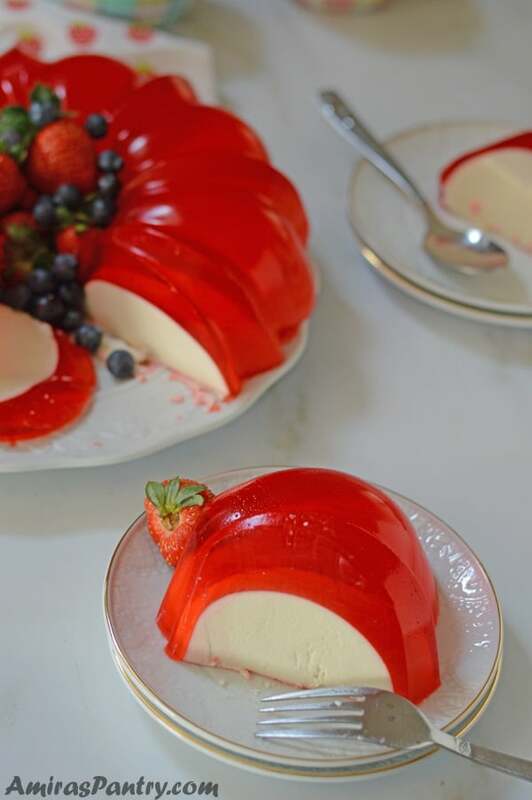 A festive cream cheese jello recipe, one of the best jello mold recipes you can make. A luscious cream cheese sweet gelatin layer hugged by a strawberry jello and topped with fruits. A delicious no-bake easy dessert that has the wow factor you need. This dessert is so easy to make, as well as make-ahead, it just requires time to set in the fridge while you enjoy your time with family and friends during the holidays. Adding some fresh fruits in the center gave this dessert a healthier look. Try these mini pomegranate jello parfaits, so decadent. 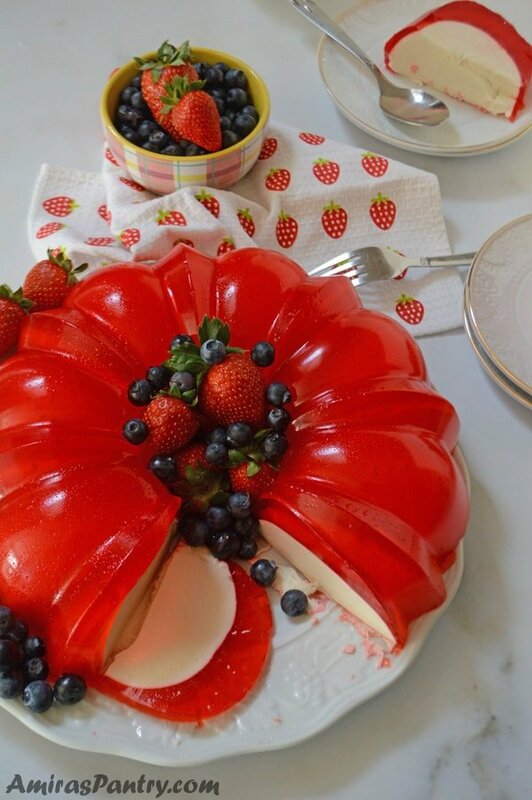 Jello strawberry cake or should I say jello strawberry bundt is a no bake cream cheese and strawberry mold that will get everyone excited. So light and refreshing. If you are looking for something to make that looks fancy and will make an excellent impression, this is the one. My kids were so excited to try this out, they kept seeing it in the fridge for almost two days while I was waiting for some quality daylight to shoot it. I am a visual person so, I love Pinterest. I can seriously lose track of time scrolling through so many ideas there. From home organizing to DIY, kids crafts, recipes, fitness ideas and so on. I honestly like it more than facebook and I can spend hours and hours there wandering aimlessly between all these great photos. 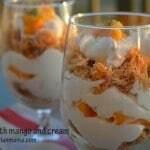 One day I was looking for ways to consume gelatin when I stumbled upon this dessert idea. This lovely lady here on youtube has so many gelatin cake/mold/bundt, or whatever you want to call them, ideas that are so brilliant and look so good. Among all the fantastic ideas that she had, I’ve decided to try this one. It looked promising and very appealing. 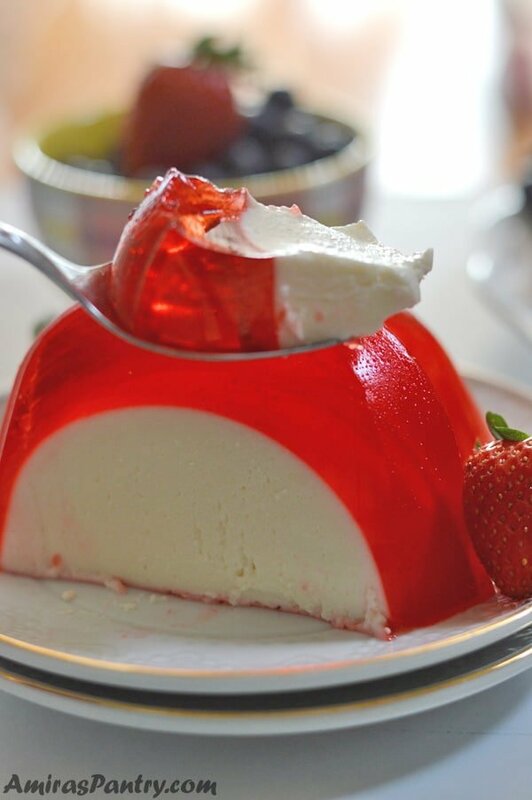 This jello dessert can be made to celebrate Christmas, Valentine’s day, Mothers day or to celebrate any day of the year actually. Simply change the fruits and the jello color to go with any theme you want. My mom loves jello, I can hold her genes accountable for the three jello monsters I have at home. In Egypt though, we are used to having jello cups filled with fruits, most commonly banana slices or apples. Unlike here in the US, jello is consumed as is, which of course a thing that mama did not approve and scolded me for giving my kids jello without fruits. As determined as all grandmas are, she went on a mission to make my kids love jello cups with fruits. And to my surprise, she succeeded , I’ve tried this may be 7 years ago and just gave up!. Her point is that without fruits, jello is just sugar and flavor nothing nutritional in there. I think my mom will like this as well, because it has milk and fruits are thrown around it freely for you to pick. It turned out beautifully colored and very tasty..
What type of bundt pan should I use? Practically any bundt that can hold up to 12 cups, which is the standard, will do. Just try to avoid pans with very decorative details, like those with castles and stuff at the bottom as the jello would not hold the shape neatly and might tear giving you a hard time to get it out. I’ll put up a link by the end of this post for the recommended bundt pan that I’ve used many times for this recipe. In the video though, you’ll see me using a different bundt pan which gave me a hard time and I am not using anymore. I’ve had an amazing fan over pinterest who made this recipe as a soccer field with green jello and she made it in a rectangular pan. So bottom line, get creative. How long can jello last in the fridge once made? 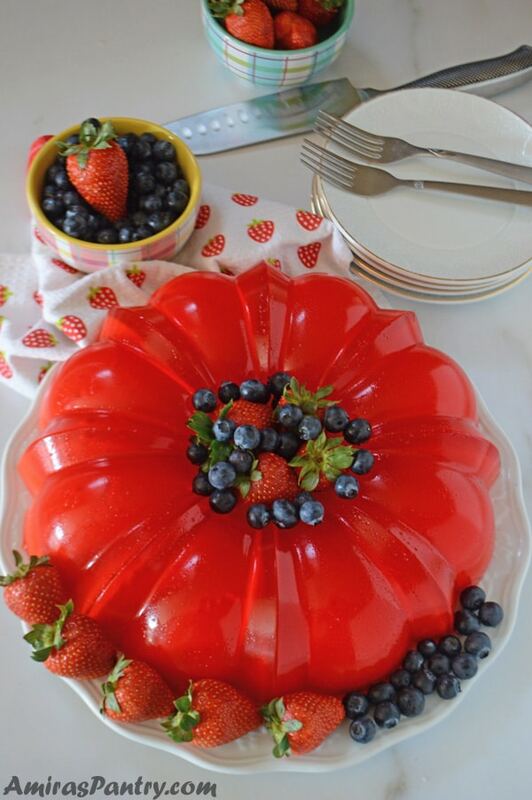 As a general rule, jello can stay in a proberly sealed container in the fridge for up to 7 days. In our case here and because we are using different types of milk, I would suggest 5 days at most. Sprinkle gelatin on a cup of cold water and let stand for 10 minutes or so, the powder will kind of sets and blooms. In the video above I think, as my Spanish is ahem tarnished, she warmed the water a bit before adding the gelatin powder. I did not do that as the gelatin I have should be sprinkled over cold water. So read the instructions on your gelatin packet first first. After gelatin has turned into gel form, microwave for 40 seconds to turn it into liquid. In your mixer, add cream cheese, both milks and the gelatin. Mix until everything is very well combined. Oil your bundt either by a spray, a brush or with a kitchen towel just wet enough with few drops of oil. Pour the cream cheese mixture and refrigerate for a couple of hours to set. Make the Jell-o by following the instructions on your packet. Dissolve the jello in hot water first then pour in the cold water and waiting for it to completely come to room temperature. Take the bundt out of the fridge and try carefully with your fingers to loosen it around the edges. 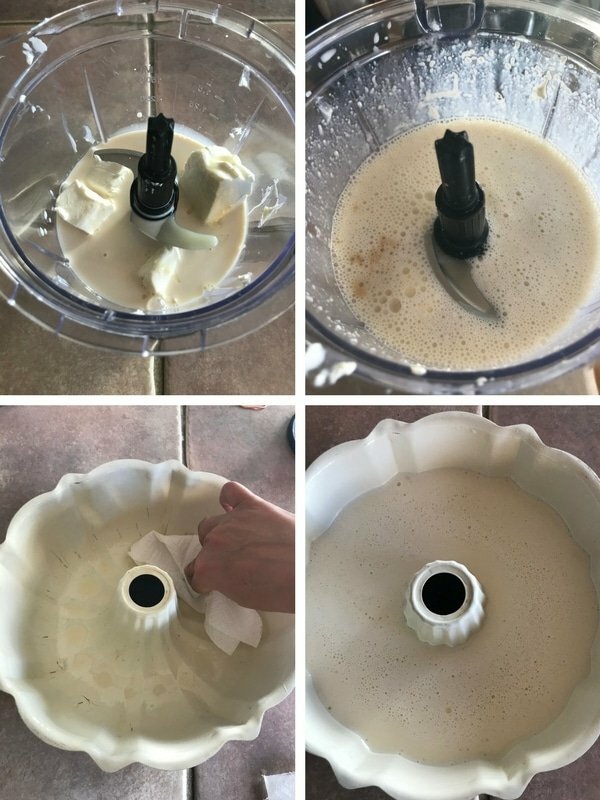 You can also try to flip it over in a plate then immediately return it back in the bundt.This step is shown in details in the video. Now pour the jello over the cream cheese, you’ll notice that the cream cheese part will float. Return to fridge to set. Now to get it out of the pan,this is the part when I usually get nervous, try putting it in hot water for just 5 seconds and it will come out easily and nicely. Turn it into your serving platter garnish with lots of fruits free style. Now slice and serve, so delicious and feeds a crowed easily. 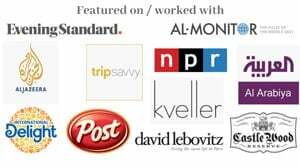 Thank you for supporting Amira’s Pantry! 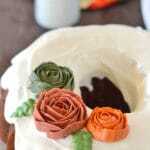 Here is the bundt that I like and use almost in every bundt recipe I have here on the blog. The Nordic 12cup Bundt is heavy, sturdy and no cake has ever got stuck in it. 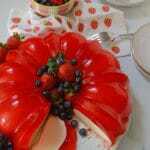 A luscious cream cheese sweet gelatin layer hugged by a strawberry jello and topped with fruits. 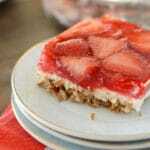 A delicious no bake easy dessert that has the wow factor you need. 3 Tablespoon powdered unflavored gelatin. 1 block 8 oz cream cheese. 1 can 14oz sweetened condensed milk. 1 can 12oz evaporated milk. Sprinkle gelatin on cold water and let it stand for like 10 minutes until it solidifies. Heat in the microwave until it turns liquid again, almost 40 seconds. In your blender add, cream cheese, gelatin, vanilla extract and both milks. Mix well until everything is combined. Lightly brush or spray a bundt pan with oil, pour the cream cheese mixture in and refrigerate for 2 hours. 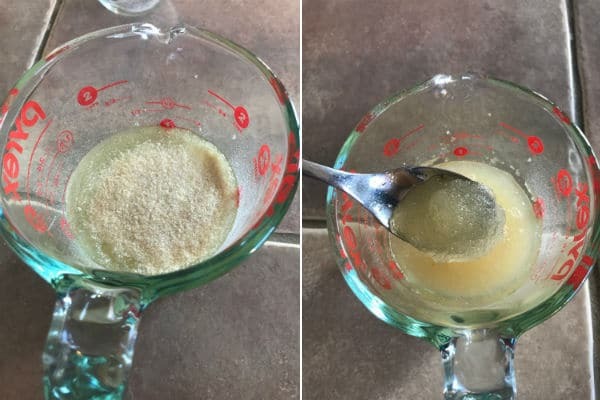 Prepare jello according to package directions by simply dissolving the packet in 2 cups of hot water then adding the cold water in and mix well. Let it cool down completely to room temperature. After the jello has cooled, take off the bundt from the refrigerator and try to separate the cream cheese layer from the pan. You can do this by trying to loosen it with your fingers from the edges or carefully turning it into a plate and quickly returning it back again. Poor hello mixture over, you’ll notice that the white layer will float over the jello. Refrigerate again for another 2 hours or overnight to set completely. 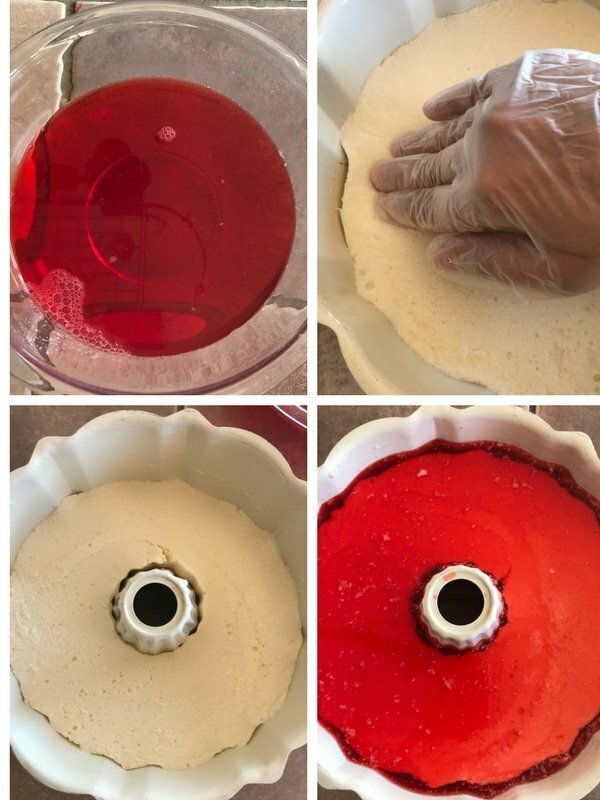 Take your jello cake out by placing it briefly for like 5 seconds in hot water. Flip it into a serving plate and garnish with fruits in the middle and around the plate. I have cond need milk but no evaporated milk…will anything eke work? Teri, you might want to try making your own evaporated milk if it is hard for you to get a hold of it. I haven’t tried it before with regular milk. Ny guess is evaporated milk is richer and will give it a more creamy texture. Love the look of anything made in a bundt pan. Very creative — this looks like so much fun. Thanks!